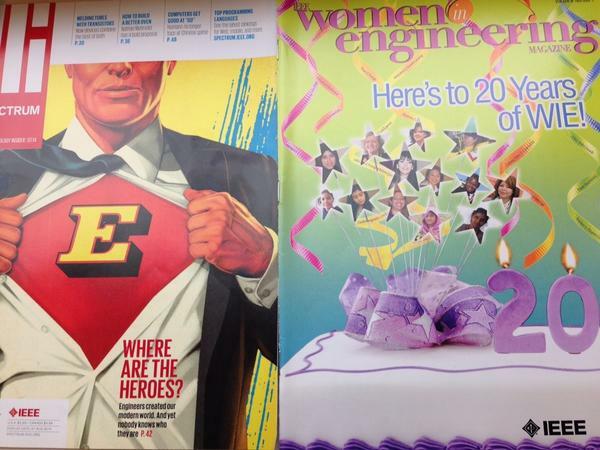 Shame that the missing engineering hero on the cover of IEEE Spectrum’s July issue looks like superMAN , because the IEEE Women in Engineering (WIE) lunch at IROS 2014 was a super gathering of high achievers who are making statements about 6% representation looking more like a glass half full, if you harness the potential. Lynne Parker, for example, is the General Chair of ICRA 2015, with a 50 strong all-female organizing committee for the premier robotics research event . ICRA is the IEEE Robotics and Automation Society’s flagship conference and is a premier international forum for robotics researchers to present their work. The 2015 conference will be held May 26-30, 2015 at the Washington State Convention Center in Seattle, Washington, USA. Having an all-women committee serves as an important watershed for the robotics community. Parker said, “There are usually only one or two women involved in conferences and when I ask why so few, people say that there aren’t enough women with experience. So, look at all these women with experience now who can be helping with future committees.” Women might make up only 6% of the global IEEE community but Parker feels that even that presence hasn’t been sufficiently felt. She also encourages women to submit papers or workshops to ICRA 2015 by the deadline of October 1st, 2014 (just around the corner!). As well as the incredible list of women on the ICRA 2015 committee (below), Robohub published a ’25 women in robotics you need to know about’ list in 2013 and we’ll be publishing a new list for Ada Lovelace Day on October 14, 2014. Ada Lovelace Day celebrates the achievement of women in computing, science, technology and engineering. Of course women are not the only ones who can change the demographics of the field, but it definitely helps to see women rising to positions of influence. For example, Lynne Parker has just been appointed Division Director for the NSF’s Information and Intelligent Systems (IIS) Division within the Computer and Information Science and Engineering (CISE) Directorate. We also heard from Ayanna Howard, HumAnS Laboratory and GIT, and Jeff Trinkle, NSF, NRI and Rensselaer, at the WIE luncheon at IROS 2014. With over 15,000 members around the world, IEEE’s Women in Engineering (WIE) is the largest international professional organization dedicated to promoting women engineers and scientists and inspiring girls around the world to follow their academic interests to a career in engineering. Formed in 1994, the luncheon marks the 20th anniversary of WIE.